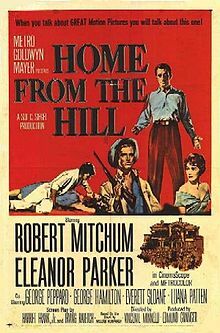 Robert Mitchum in "Home from the Hill"
“I covered everything from track meets to debutante parties, from murder trials to street demonstrations, and truly my newspaper job was an education worth as much as all the years I attended school. 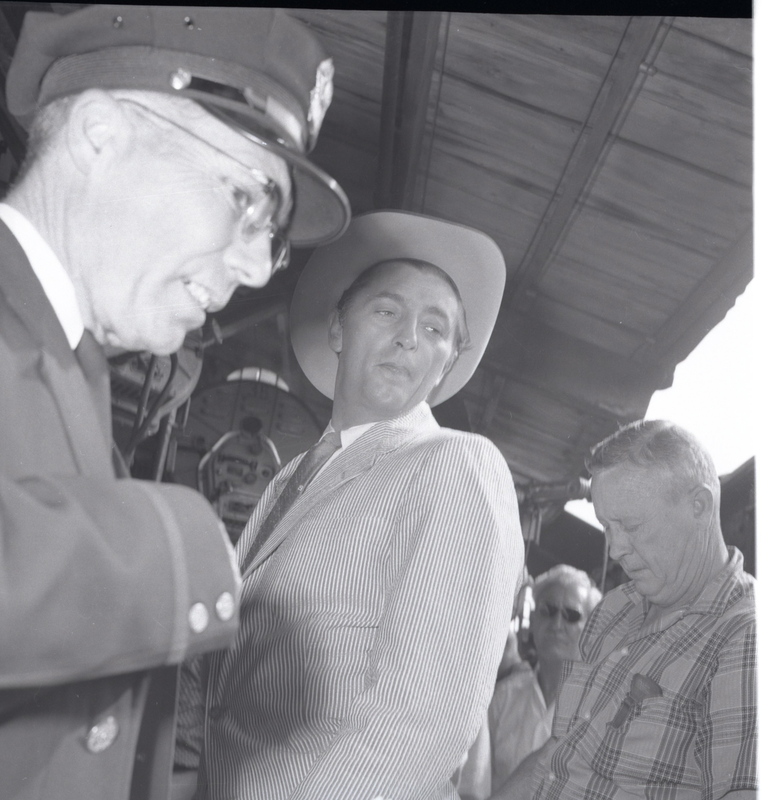 There were many exciting times and I was in a position to meet a number of celebrities and important people. Movies, or parts of movies, such as Ode to Billy Joe, The Reivers, The Music Man and Home from the Hills were made in or around Greenwood, and I got to take pictures and talk to some of the actors and actresses including Robert Mitchum, George Hamilton, Ralph Bellamy, George Peppard and director Vincent Minelli. One of my biggest thrills came from being able to introduce Mama to Mark Rydell, who was directing The Reivers. He had played the role of Jeff Baker in As The World Turns. Gosh. To think Sara gave up lunch with Robert Mitchum and George Hamilton to come home and make me a grilled cheese. That’s maternal dedication. 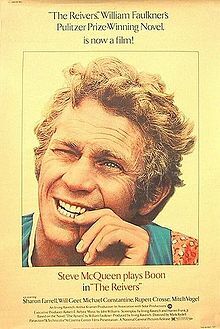 She loved having those movie companies in town, whether it was the upscale crews for The Reivers, with its big-name stars like Steve McQueen and Will Gear, or the fly-by-night cheesy B-movies like Ode to Billy Joe. There was just something about all that acitivity and energy and stardust that thrilled her, and I wished over and over again last year that she had lived long enough to see The Help take over Greenwood. She did read the book and was surprisingly noncommittal about it. I think she was of the generation that had lived that life and she found the fictionalization (and to some degree, sensationalization) of it off-putting. The incident she mentions with Mark Rydell begs expanding on. Sara, Jessie, Big and other women in our family were riveted to As the World Turns for decades, from the first day that Chris and Nancy Hughes walked into their lives in 1955 or so, courtesy of CBS, until they could no longer follow the plots (or lack of plots). If you were hungry or bored or bleeding to death on a weekday between 12:30 and 1:00, that was just your bad luck. You could not raise an adult female in this family to tend to your crisis for all the tea in China. And “Jeff” was a much beloved character, somebody-or-other’s husband, who slammed his car into a concrete embankment when actor Mark Rydell decided to ditch that job for directing. So here he is, Jeff resurrected and in-the-flesh, right there in Greenwood, trying to direct The Reivers, and Sara dragged the poor man over to meet Jessie and Big. They were like starstruck teenagers swooning over the Beatles, and Big kept lapsing into calling him “Jeff.” He was the sole of kindness and patience, and that is a lovely, enjoyable movie. 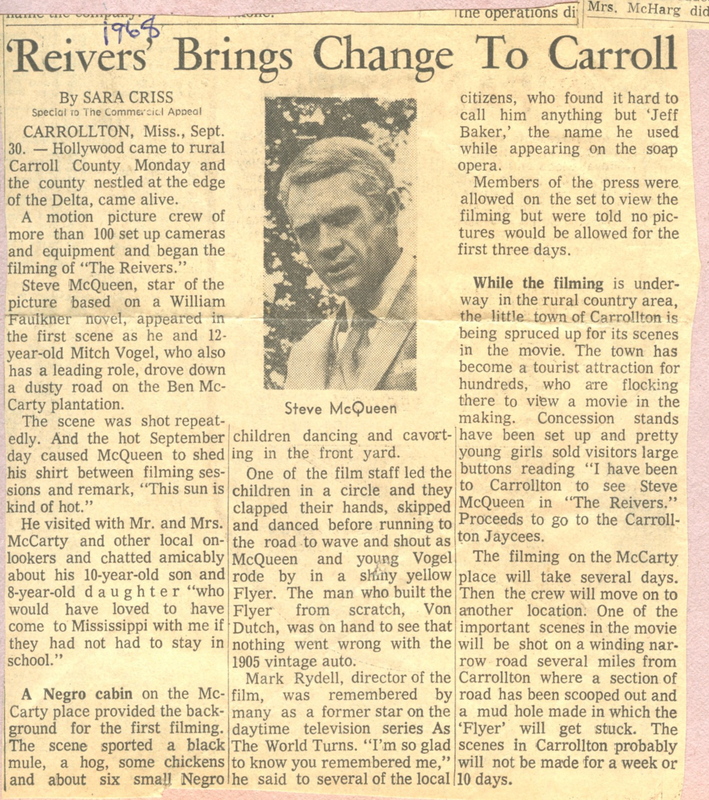 One of several articles which Sara wrote on "The Reivers"
The Reivers is one of my favorite reads (and movies). My dad loved the movie so much, he put us in the car one summer and declared we were taking a trip to the town where The Reivers was filmed. It was not Greenwood, but I don’t remember the name of this teeny little town, where a soda fountain was open but they had no bananas for a banana split, so I walked two doors down to the little grocery, bought a bunch of bananas, and toted them back to the little ice cream place. My dad got his banana split, and we got to “tour” this little town, which was just a postage stamp, really… sorta a letdown in the end. Sarah had much better luck! And The Reivers is still a wonderful film. What a wonderful story! The little town is Carrollton, which was the perfect setting for 1904 Jefferson, Mississippi. In 1969, all the movie company had to do was layer the streets with dirt and turn a gas station into a livery stable with a false front. Everything else was already a century behind. It’s still a lovely town, now with a few more businesses and one of the best small restaurants, Miss Sippy’s, in the state. Next time you’re in Greenwood we’ll go out and get some chicken salad. And I’ll bet Betty Ray, the owner, would fix you up with a banana split if we gave her some advance notice. My parents were ATWT groupies, too! So was my grandmother. I soooo identify with the statement that you could be bleeding to death, and it was just too bad. BTW, Jeff Baker was married to Penny Hughes. Yep, I couldn’t help but watch it, too when I was at home at lunchtime with the folks. Meg Ryan got her start on that show playing Betsy, in case anybody is interested. 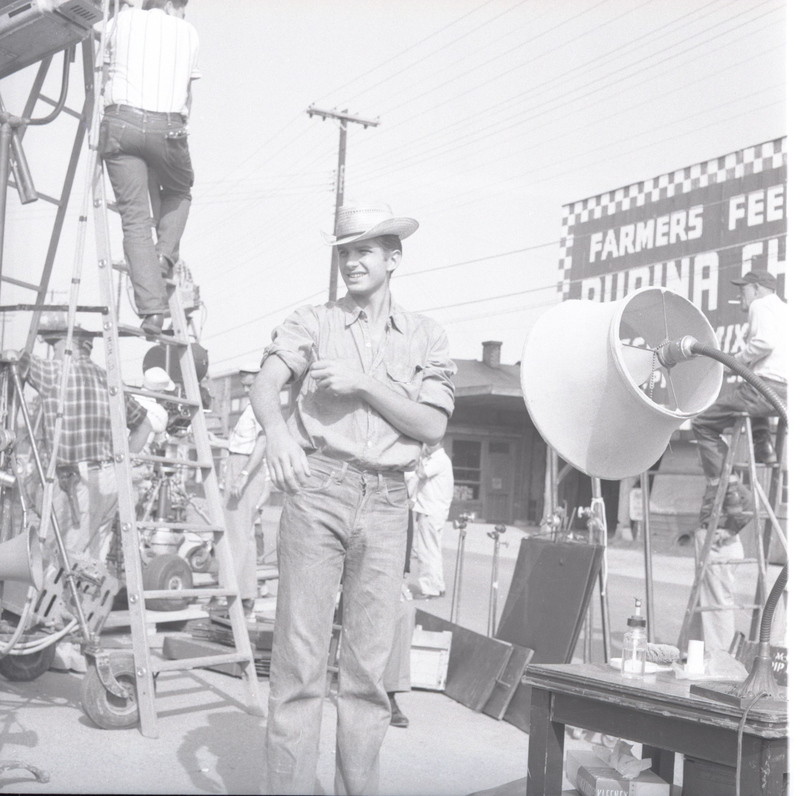 I am sure if my folks could’ve met Mark Rydell, they would have been excited, too!